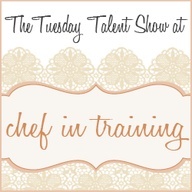 Hello, and welcome back to this week’s Tuesday Talent Show! I am headed to Austin, TX this week for BlogHer Food, any of you attending as well?! If so, lets be sure and meet up! I want to apologize, due to lack of time this past week, we are not going to be having any features this week, BUT we are still going to have a fantastic party! I can’t wait to check out your latests and greatests! Hope you enjoy BlogHer Food! Thanks so much for hosting. Thanks for hosting, Nikki! Have at BlogHer!!! Thanks for the party, Nikki! Thank you so much for hosting, Nikki. Have a great time at BHF!! Wish I could head to Austin, but I’m off to the Big Island at the end of the week…. Beach and Breeze or Hot and Humid… Who am I kidding… I wanna go to Blogher :( Have a great time! Thanks for letting me share. Have a great week! Wish I was going to BHF - would love to hang out with you again! Thanks for the party Nikki. Have a fantastic time at Blog Her Food! Thanks so much for hosting! I've just gone through the party and pinned some amazing ideas and found some great bloggers! Success!! Thanks again! Thanks for hosting Nikki! Have a great time at BlogHer! Hi Nikki, I will be at Blogher food! Maybe I will see you there!